Those words were muttered on our wedding day. When I learned of that, I must be honest, I was thoroughly offended. How could someone be so superficial and cold? I was upset that was something people were actually thinking about on a day that was supposed to be a celebration of our love and oneness. I let it get to me and began thinking I needed to validate our love to everyone. I felt I had to prove that what we had is real. It was real and has always been real. Chris and I never questioned it, so it surprised me that others did. I have since had a change of heart regarding my upset over that comment. I realize now that maybe the individual had some insight to the pain I would inevitably feel and the stigma I would have as a young widow. Maybe they knew how difficult our road would be and how heartbreaking it is to watch one’s spouse suffer with such a terrible disease. What this person may not have considered, however, is that Chris and I were not simply making a choice to love each other wholly, we were fulfilling what God had intended, what we were being called to do. Love isn’t always the same story. We can hope we live out our days together, have children, grandchildren, and then die in each other’s arms Notebook style, but unfortunately, that doesn’t happen very often. I dreamed of that with Chris. I naively hoped he would survive many years and we could live a full life together. I begged God all the time for that outcome. What I didn’t realize, though, was that I was just falling into the ideal we have created for love. I had the idea of love just sitting pretty on a pedestal in my brain surrounded by a white picket fence. Through Chris, God taught me how to truly love and that experiencing the fullness of love doesn’t have to be over the course of 30 or more years. It was a quiet night and I was finishing some laundry at the laundromat. I went home and began folding my clothes. It wasn’t long before I heard Chris coming through the back door. He was out of town for a little while and I wasn’t expecting him back so soon. I immediately ran to him and nestled myself in his chest. He hugged me differently that time. He held me a little tighter and longer. He stood up straighter, almost to make himself bigger so he could completely cover me with his hug, protect me. That night, he told me the doctors found cancer in his lung. We weren’t aware of more information than that, but I spent the night sobbing in his arms. At that point, we had been dating for about 4 months. And at that point, we were already completely in love. Not long after that night, we sat in an exam room anxiously awaiting results regarding the extent of his cancer. The doctor entered the room and explained to us that Chris had lung cancer that had already metastasized to his bones. He also explained that his mutation was very rare and could not be cured. He was terminal. My world came crashing down on me. Chris and I were already planning a life together and in the blink of an eye, it was shattered. My body felt like a bag of rocks, much like it does now. Shattered and lost… Chris was more accepting though. He trusted God’s will probably more than any other human being I know. He was accepting of whatever God laid before him. I, however, was a complete emotional mess and I suppose you can say I was a mess for the both of us. I had more difficulty accepting God’s will. We knew our life had changed that day upon his diagnosis of terminal cancer. What we didn’t know was that our love will change too, for the better. 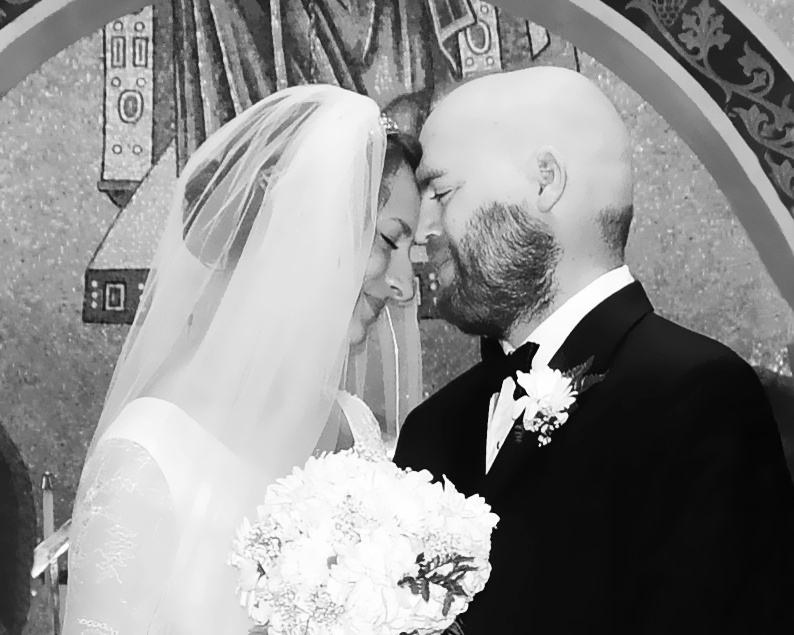 Our love morphed into something that went much deeper than before his diagnosis. Perhaps we were forced to reach the point in our love that healthy couples eventually reach after 50 years. We took each other as is. We saw the inner light of our hearts rather than our hearts alone. It was complete selflessness and sacrifice that became the foundation of our relationship. We never stopped serving the other. Even on his deathbed, my husband wanted me to sleep in the hospital bed and he on the window bench I had been sleeping on because he wanted me to be more comfortable. The care and love that man showed for me has changed me forever. I thank God so much for our love. I learned what self-sacrifice really is too. I never wanted my husband to be uncomfortable either. I bathed him, wiped him when he went to the bathroom, brushed his teeth, trimmed his nails (which I would never do for any other human being), cleaned up his vomit, cleaned up his diarrhea, went to the store the minute he mentioned he had a craving for something specific, and labored in the kitchen until I made something he would want to eat. I kept our life moving as his body slowed down and he kept me humble and grounded as we faced the most difficult time of our existence. We pushed past the superficial things quickly and truly saw the other. We saw each other fully and unconditionally, and we brought each other closer to God. We were blessed in a very devastating way, but it was still a blessing. “Why is she marrying him if he is going to die?” In other words, why would I risk feeling the pain of loss knowing my love will leave me soon? Why would I commit to a dying man? Even Chris told me, a few months after his diagnosis, that he didn’t want me to feel the pain when he left me and I should leave him while I could. He didn’t want me to feel the pain, so he preferred to sacrifice himself, to endure the pain he would feel alone. I responded, maybe a little offended, but I understand now, “I will never leave you. You are my love and I am yours and I will be with you until the very end.” He accepted my decision and later admitted that he never really wanted me to leave, but felt he had to say it at least once so I would know he didn’t want to leave me here alone. We married because we loved. We loved because we were called to love. We were also called to learn, and we were called to teach. Again, like Chris would say, “there is no such thing as ‘fair’ and ‘unfair’. It just is.” I believe God gave him the insight he needed to teach me from spiraling down into a pit of self-pity. My friend solidified that too. Chris and I made the ultimate sacrifice to serve as the lower in this case. By this, we loved wholly, learned humbly, and will teach with great humility. We were and remain blessed in many other ways though. We don’t carry the lower in every aspect of our life. The mystery of God will continue to be unknown to us, but with faith, we can accept His will and follow the truth. That, my friend, is why I married him. For everyone who does not have the “white picket fence” sort of marriage. Thanks, Liz. This too is a romantic ideal of marriage. Loving someone who is going to sleep in death takes courage and faith. When sleep comes the loving couple are separated. The one left behind has no idea of when she will see her beloved spouse again. She may not feel like marrying again. So she may chose to remain single. Some may see that as the ideal while others may question that choice. I think there are many ways to show love for others. One book I found that is helpful is the book The 5 Love Languages by Gary Chapman.